New Relic vs. Scout: which is right for you? There's no type of monitoring tool that can get to the heart of a performance problem faster than Application Performance Management (APM). If you're making this decision, you may be choosing between New Relic and Scout. There are cases where New Relic is a better fit, clear cases where Scout fits like a glove, and some murky situations as well. Where do you fall? Below, I'll summarize the factors to consider when choosing your best APM product. Scout's monthly fee is about 30% lower than the monthly fee in a New Relic annual contract. In most cases, Scout will also buy your New Relic contract. Scout supports Ruby, Elixir, and Python with a Core Agent API that can be used to instrument any language. New Relic supports Ruby, Java, Node.js, PHP, .NET, Python, and Go. Let's start digging through the products, starting with the app overview. The top portion of the page is similar between New Relic and Scout: a breakdown of time spent by category (ex: Ruby, Database, External HTTP services, etc) over time. 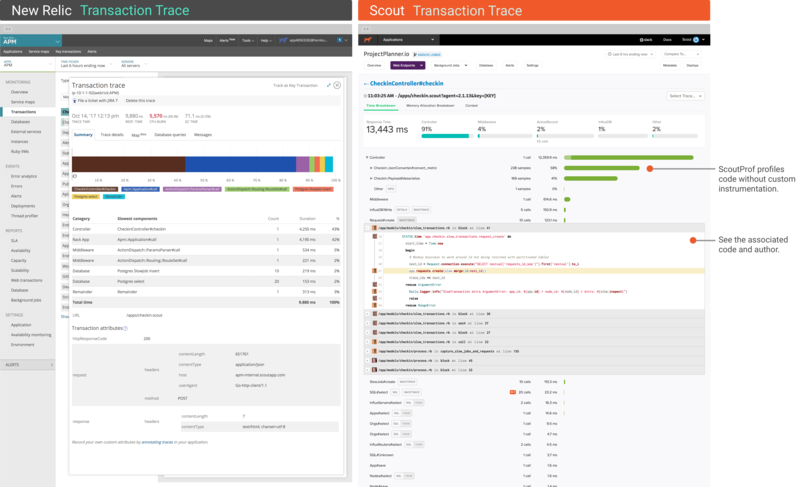 You can view data across similar timeframes in both Scout and New Relic (New Relic offers three months of data in their Pro package and Scout can do the same in their custom plans). Both let you compare data to the past. Scout gives a few more options than New Relic, which is restricted to yesterday and last week comparisons. The biggest difference with Scout's approach: several algorithms dig through your data and generate insights on performance directly on this page. For example, Scout identifies slow database queries, N+1 database queries, and memory bloat. These are ordered by impact, which help you decide where to get most improvements in the least amount of time. Scout short-circuits the work a Site Reliability Engineer (SRE) often performs when investigating the health of an app. Let's move from the 10,000 foot view to the soul of application monitoring. The soul of app monitoring is the transaction trace: all the metrics and analysis an APM platform delivers originates from data collected in a trace. A transaction trace is a breakdown of time spent in a single web request or execution of a single background job. Scout provides a breakdown of memory allocations in addition to timing metrics. New Relic does not. New Relic offers cross-application tracing if your app touches another app you've monitored with New Relic. Scout does not. 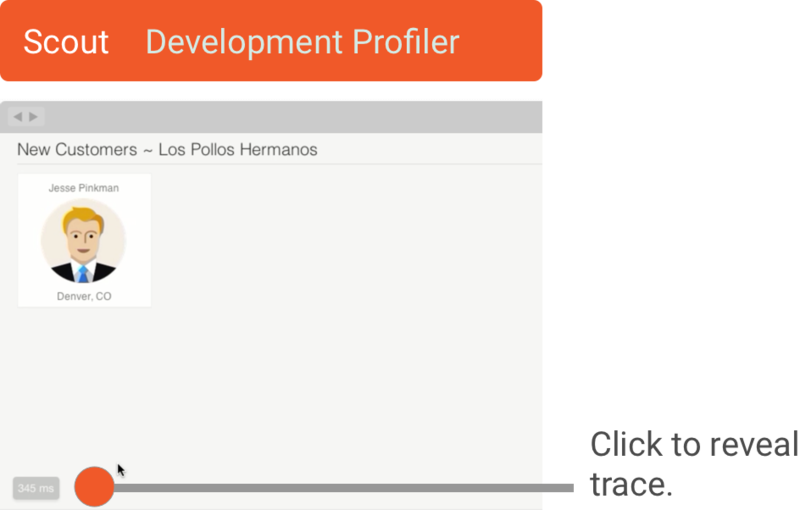 Scout is more likely to provide backtraces to slow method calls and can also display the code directly in the browser. Scout can breakdown the time spent in custom code via ScoutProf. New Relic requires custom instrumentation. 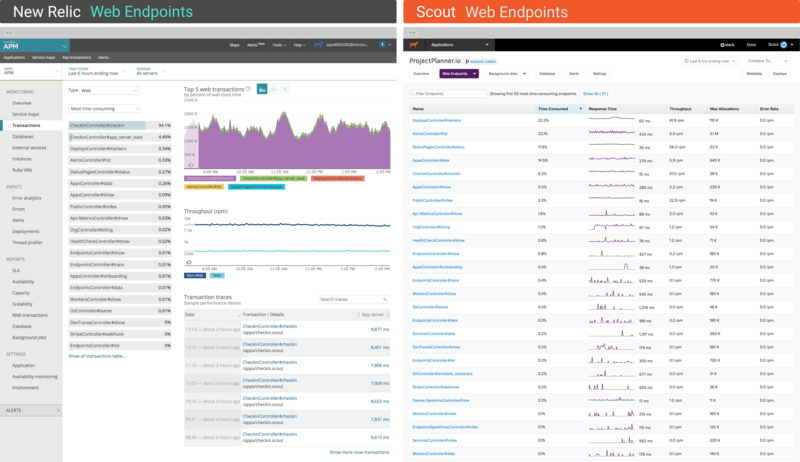 Scout typically collects more traces than New Relic. Both New Relic and Scout have similar, one-week retention periods for traces. For the trace, we focus on action: which code paths are significant bottlenecks? What is the code in those bottlenecks? What are the details around slow SQL queries (ie: number of records returned)? New Relic opts for several different visualizations on this page. Scout goes with a filterable, sortable view. Both sort web endpoints by percent time consumed by default, helping you focus on the controller-actions that consume the greatest amount of time. My favorite feature on this page is the filter above the list of endpoints. It drastically reduces the time needed to navigate to an endpoint or a group of endpoints I'm investigating. Since this is a high-frequency action, the time savings adds up. New Relic offers a histogram display option of response times and Scout does not. Scout offers memory allocation metrics (more allocations lead to increased memory usage) while New Relic does not. 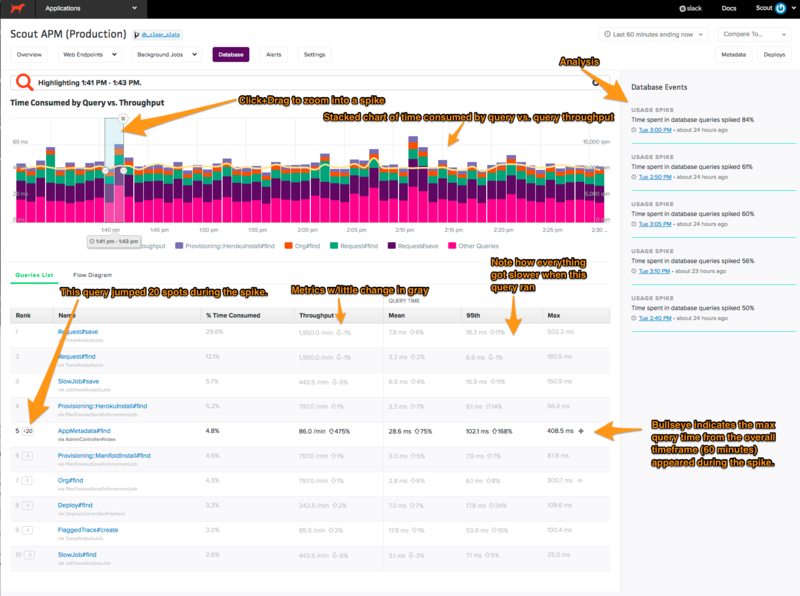 New Relic's breakdown provides more categories, while Scout focuses the breakdown on database queries. Scout typically provides more transaction traces (up to 10 per-minute) and more options for sorting and selecting traces. 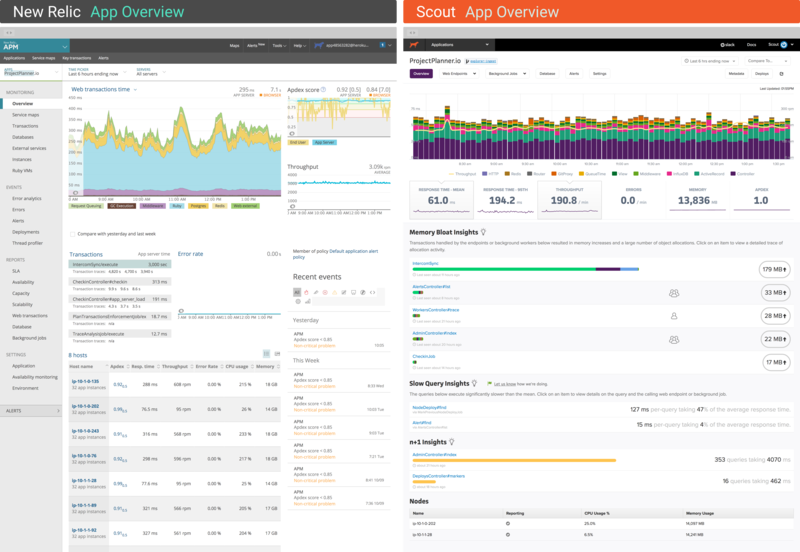 Both New Relic and Scout monitor the core Ruby background job frameworks: Sidekiq, Delayed Job, and Resque. The UI is similar to endpoints, so I haven't provided a screenshot here. Scout's chart displays data across every query - not just the top five most expensive queries - by combining less expensive queries into an "other queries" metric. This gives a more complete picture of performance. New Relic provides monitoring beyond ActiveRecord. Scout focuses on ActiveRecord. Scout's list of queries includes the calling controller-action or background job. Expensive queriers are frequently triggered by a few hotspots in the code: this makes it easier to identify those spots at a glance. When you are actively resolving a performance issue, it's helpful to get immediate feedback on the results as you code. Otherwise, you need to deploy and wait for fresh data to verify the change had the intended impact. New Relic used to have a developer mode, but it has since been removed from the agent. Slow feedback cycles - like a long-running test suite - are painful. DevTrace eliminates a lot of this as you can instantly verify that an optimization - like fixing an N+1 query with `includes` - is working as expected before deploying. Weekly emails with lots of metrics become repetitive. We attempt to dig through the data and identify underlying causes - like a specific slow query - to push you towards a fix. 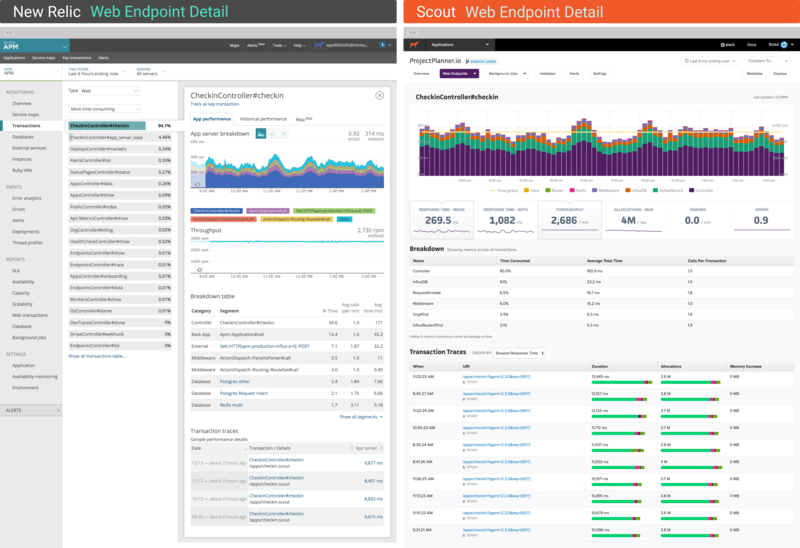 Scout and New Relic have comparable alerting functionality. The impact of agent overhead increases as CPU resources on your app servers becomes more scarce. Scout tracks error rates and integrates with third-party services like Rollbar to provide details on exceptions. New Relic can provide this data, including backtraces to exceptions. Why don't you just tell me which to use? New Relic and Scout require little configuration - outside adding a dependency - to try. You can run Scout and New Relic at the same time without causing conflicts. My suggestion? Try Scout alongside New Relic, then ask: "which tool helps our team solve performance issues faster?"